Kate Montgomery is currently doing a PhD in drug delivery using polymer based nanoparticles, her project is a collaboration between Imperial College London and CSIRO in Melbourne. When she is not making extremely sticky polymers in the lab, Kate enjoys reading, running (very slowly) and deep sea diving. 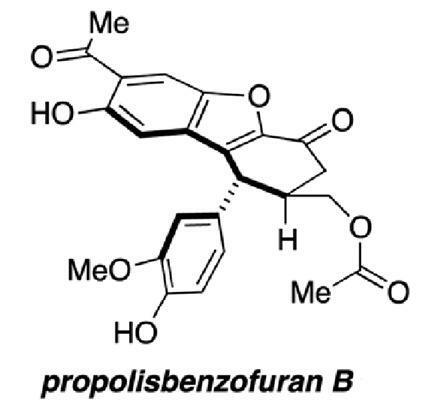 Regan Thomson’s group from Northwestern University, Illinois, present the first total synthesis of propolisbenzofuran B. The synthesis has been completed in 17 steps, starting from the phenolic aldehyde, vanillin. In the natural world propolis is a resin made by bees and used in their hives to preserve a sterile environment. It encases waste and carcasses to prevent the decomposition of proteins and therefore decay. The beneficial health effects of honeybee products have been hypothesised since ancient Roman times. More recently it has been determined that propolis has many biological and pharmacological properties including antibacterial, antibiotic, anti-oxidant, anti-fungal, anti-cancer and anti-inflammatory activities. Propolisbenzofuran B is a natural product found in Brazilian propolis, first isolated in 2000 by Banskota and co-workers. Initial biological testing determined that the compound had a cytotoxic effect on murine colon 26-L5 carcinoma and human HT-1080 fibrosarcoma cells. It was not only the promising range of biological activity which drew the authors’ attention to this particular compound; propolisbenzofuran B has a unique core with an unusual ring-system. The development of an efficient synthesis for this core opens the door to further biological evaluation and possible modifications to the compound. Highlights of the synthesis include a silicon-tether controlled oxidative ketone-ketone cross-coupling as well as a novel and efficient benzofuran cascade. The cascade was discovered to be induced rapidly with the addition of trimethylsilyl triflate to the 1,4-diketone precursor. The authors believe this methodology will be useful in the synthesis of other complex molecules containing benzofuran groups.